Having recently performed her programme of Bach's Sonatas and Partitas for unaccompanied violin at St George's Brandon Hill, violinist Kyung Wha Chung will be repeating the programme at the Barbican on Wednesday 10 May 2017 (see my recent interview with her). As a preview to Wednesday's concert the star appeared in a Q&A with James Jolly (editor in chief of the Gramophone Magazine) at the Korean Cultural Centre in London. 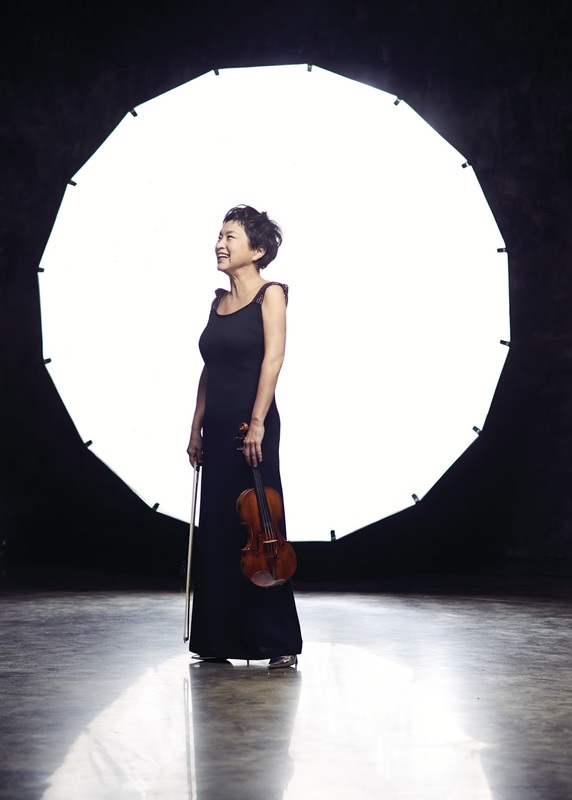 Miss Chung is an engaging speaker, and her discussions with James Jolly ranged widely from her upbringing in Korea, through to her current tour of Bach. One of nine children (seven surviving), four of them studied music partly because their mother loved classical music and was ambitious for her children. Miss Chung emphasised that Korea at the time (in the aftermath of the Korean war) was suffering terrific devastation, and all people had were their hopes and dreams. Yet though her mother was ambitious for them, the children were free to express themselves as they wished. There was more culture and art about than might be thought, one of her uncles studied the violin in Russia, and students talked about nothing but culture, and there was singing everywhere. As a child Miss Chung was shy, yet performing livened her up. When she played her first concerto, Mozart, it lit her up and this connection with the audience is a common thread running throughout her career. She commented that she loves going into the audience's soul. In 1961 she started studying at the Juilliard School with Ivan Galamian. He was a strict disciplinarian yet gave his students a structure without changing the character of their playing so that her contemporaries who also studied with Galamian (Pinchas Zuckerman, Itzhak Perlman) all have very different sounds. She would have to learn a concerto in two weeks and be ready to perform it, she commented that a piece never comes alive until you have performed it in public. She also added that she was far more comfortable on larger stages, the bigger the stage the less nervous she was. One of the strongest influences on her in terms of sound was the violinist Paul Makanowitzky who taught at the Juilliard in 1965. But she also conceived of the idea of studying with Jascha Heifetz. Her sister studied with Piatigorsky and had warned her that Heifetz was a strange man and that she should not be late for the audition. She flew to Los Angeles and worried about being late, arrived early. Heifetz finally opened the door a crack and told her brusquely that her audition was in three minutes time, and shut the door again. This made her angry, so she wanted to show him during the audition, which went well, Heifetz commented that 'I think you love playing the violin', yet she did not study with him because he wanted her to learn without a chin-rest and at 19 she did not feel she could start learning her technique all over again. The recording industry has changed radically since she started recording; she would do around 20 performances of a concerto, then record it and then move on to a new project. Whereas nowadays, once a recording is done an artist must get involved in promoting it, often doing a concert tour. Her roster of early recordings includes many of the great conductors of the time, and she commented that she thought that it made a difference if the conductor was a string player as Klaus Tennstedt (a favourite conductor) and Carlo Maria Giulini were. She recorded the Tchaikovsky concerto with Giulini and found his speeds slow, yet when she finally listened to the recording many years later she found his performance fantastic. She never recorded with Karajan, she found the idea too scary. Kyung Wha Chung performs Bach's complete Sonatas and Partitas for unaccompanied violin at the Barbican, 10 May 2017. See the Barbican website for details. The final concert of Kyung Wha Chung's Bach tour is at Carnegie Hall on 18 May.